You know, I had an unfortunate experience with a rooster when I was a kid. My aunt and grandmother had lots of them (they lived side by side, so they shared a pen). I was supposed to gather eggs. The rooster chased me...and chased me...and chased me. I think that's why, when we incubated eggs (studying life cycles) at school, I brought home a duck instead of a chicken. We had one big rangy rooster that used to go after my kids. Both of my children were really small, 4 and 5, at the time. He chased my daughter all the way across the pasture one afternoon, through the gate, up and over the manure pile. Evil feathered critter. He ... er ... disappeared shortly thereafter. Are they still earning their keep? I was just thinking about you. I've missed you! See, Sarah? Rooster nightmares everywhere! Farmgirl, I have been lurking. I come everyday to look but can't always think of anything to say as hysterical as your captions. I just love the sense of humor you use. Cracks me up. Hey are, you going to have a Sheep blog day or a Donkey blog day? I am READY! lol! Aw, I'm so happy seeing biddy photos, we just ordered our 25 chicks to be delivered next week. Our first foray into keeping a flock. Yeeehaw! If you will check that photo of the egg from the other el-cheapo bird you will understand immediately that a good egg cannot be produced at the drop of the proverbial hat. Compare that sad thing with my brown beauty. well, what can you say? What's all this talk about ducks? It was my "job" to go get an egg for my breakfast in the morning. One morning, like Whitey and Lindy, neither chicken had produced an egg. My aunt, thinking I would be disappointed, put an egg from the fridge in the henhouse for me to "find". I came in crying, sure that the chicken was dying, because her egg was cold! They had to confess. this is the second time i have tried to post my comment. i am as hopeless as a chicken. my original comment being, i wish i were a chicken. all the cluckin' and scratchin' doesn't seem half bad. Well, ducks do have their strong points. For one, they eat flies. For two, they lay bigger eggs. 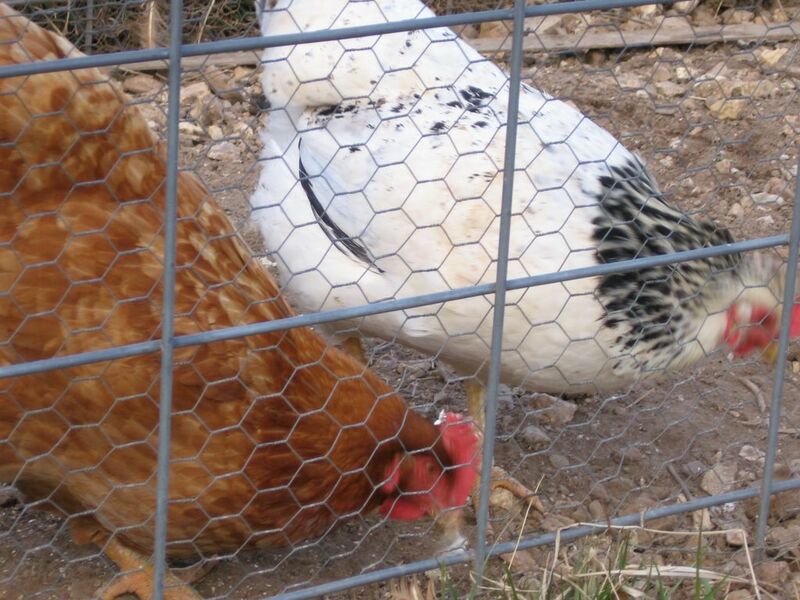 Plus I just think those white Pekin ones are really cute. I should probably stop now. You didn't fail! Your first comment posted on a different post--the "poultry" link in this photos caption. I got both comments, and you aren't as incapable as you fear. However, before one of the chickens hacks into my computer again, maybe I can save us some sqwaking (is that how one spells sqwaking? 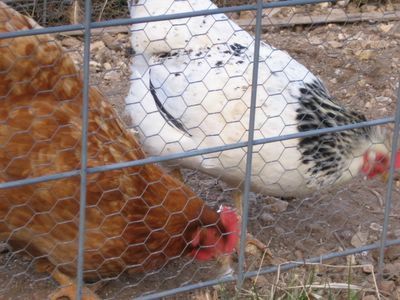 it looks weird) and let you know that (and, look, girls, I'm even putting it in bold: Chickens are not hopeless! They practically know more about computers than I do, and today I discovered that Whitey even has her own blog! That is the best caption ever!!! Farmgirl, if you have a Chicken blogging weekend, I am going to have to find some new farm friends! lol! Sadly I know no one here where I live who has chickens. Do you think strangers in the country will be respective to my knocking on the door and explaining to them how I have to take a photo of their chickens to send chicken greetings from VA chickens to MO chickens? Can we say POLICE? lol! Your chickens are beautiful. I have a brother who when we were kids had bantams and fancy chickens as a hobby. There's something neat about chickens - especially the colorful ones. I grew up on a poultry farm. And I'll have to share one gross experiences. It was one of my chores to collect the eggs. One hen apparently didn't like me and gave me a shot in an eye. Yuck! I have childhood poultry stories, too! When I was pretty small, like maybe three or four, we had some bantams. I have no idea why, unless it was pets for me. My dad built a little house for them that looked exactly like a little house. I used to love my banties and was always crawling into their house with them. As you can imagine, my mother nearly had a stroke, thinking of her baby in there with all those bird-borne diseases. But I must have been hearty, because I never came down with anything. My aunt who lived in the country had either ducks or geese, can't remember which, but they used to chase me unmercifully, until I was screaming and crying because those suckers bit! Then we got a lab who thought I was her baby. We went to my aunt's house and the birds started after me immediately, as per usual. One shriek out of me, and the lab ran those birds until they dropped dead, literally. My aunt was ticked, but she used to think it was funny that I was afraid of them. So, I was thrilled that they were dead, and I am so not that kind of person. It was just such a relief to know I'd never have to be afraid to go visit again. Surprisingly, I'm not afraid of birds, now, but I do have a healthy respect for large birds who squawk and hiss. You know, now that I think about it...that's probably why - today - I have a menagerie at my house: hogs, dogs, a cat, I had turtles. But no birds. DH said a few days ago, he'd like to get goats and chickens. You think that 20 years later I can master the art of gathering eggs? That's one....peck of a caption! These chicken stories just keep getting crazier!